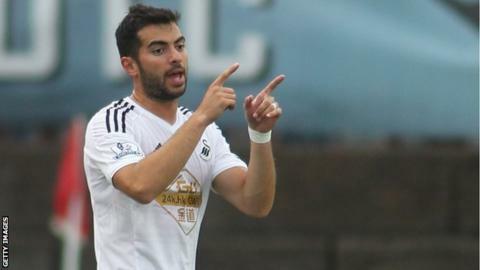 Swansea City defender Jordi Amat is out for six weeks with a knee injury suffered during Saturday's 4-2 loss at Chelsea. The Spaniard strained lateral ligaments during the first half and was replaced by Argentina international Federico Fernandez. Amat left Stamford Bridge in a brace and underwent a scan on Sunday. The 22-year-old has started all four of Swansea's Premier League matches so far this season. Swansea's 100% start to their league campaign ended against Jose Mourinho's side as Diego Costa scored a hat-trick. John Terry's own goal had given the Swans the lead, before Spain striker Costa equalised just before half-time and then scored two more goals in the second half. Debutant Loic Remy added a fourth after coming off the bench, before Jonjo Shelvey scored a late consolation goal for Swansea. Amat's injury will give an opportunity to Fernandez to develop a partnership at the heart of the Swans defence with Wales captain Ashley Williams. Fernandez, played four matches for World Cup runners-up Argentina in Brazil 2014. He has only made one start for the Welsh club, since his £8m move from Napoli, in the Capitol One Cup win against Rotherham United. Swansea City's next match is at home against Southampton in the Premier League on Saturday 20 September.